First off, you don't need fancy equipment like a baking stone for the oven or a special form of some kind - your average gratin form/cassarole top will do just fine. What you actually need is patience as sourdough bread is a question of letting the chemistry really work. You need time and temperature and that's essentially it. 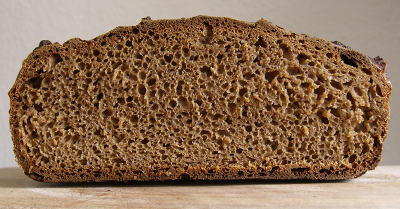 If you already have a sourdough culture (if you don't: get one here: http://www.sourdo.com/culture.htm - don't use the stuff from the store, it usally has the wrong chemistry and contains additives) you can just start to bake bread. If you don't, see at the end of the page how to cultivate your own sourdough culture. It'll take about 3-5 days. Sourdough works best with rye and with wholegrain/whole wheat flour - NOT the heavily processed stuff. It needs certain fungi and bacteria to grow and especially to stay unspoiled. If you're planning to keep your sourdough for like three generations (yes, that works): use rye. The flour you later use to mix with the sourdough may be all kinds of non-whole wheat flours - as you like it. Sourdough dies if you don't feed it. (You don't have to name it, though... ;) So, either you bake a bread once a week (or more often) or you feed every so often it or you have to freeze/dry it properly to keep it in stasis. ;) Sourdough culture also doesn't like too much heat - so don't kill it with hot water or accidently in the oven. Sourdough smells "funny" - it might smell intensively like cidar vinegar or vinegar or fruity-acid-like - everything is fine as long as it is somewhat pleasant. It also might change the colour and getting grey-ish on top or starting to bubble (that's your yeast talking...) - that's all fine. If it grows mould - which it shouldn't due to the low pH, that's one of the points of baking with sourdough - then it's time to throw it away. Don't keep it near the camembert cheese in the fridge: that's the wrong fungi and fungi spores distribute through the air. The three stages of temperature dropping and such (see below) are only on average - you don't have to measure it, just keep in mind something like "start with the heated, warm bathroom, second put it into something cosy over night and put it somewhere rather cold at last" - it's really just about feeding three times, let it rest and let the right bacteria and the yeasts grow at the right temperature. Stage I: In the afternoon, start with a mixture of 2-3 spoons full of sourdough culture, mixed with 100gr rye flour and 110gr plain water. Put it in some bowl, cover it with a kitchen towel and put it somewhere warm (but below 35°C!) The first and rather warm stage lets the yeast fungi grow nicely you'll need to rise the rather heavy dough later on. Stage III After you woke up the sourdough gets its last feeding and is kept another 6 hours at a rather low temperature around 18°C - 20°C. If the starter bubbles and grows - perfect. If it doesn't: Doesn't matter, will rise later. KEEP 3-5 SPOONFUL SOURDOUGH FOR THE NEXT BREAD! 1 TL finely ground (preferably also freshly ground) bread spices: a little fennel seeds, a little anise seeds, a little caraway seeds and plenty coriander seeds is my preferred mixture. Also delish: a little fenugreek seeds. Besides that keep about 100gr - 150gr cold water in reach to keep your hands wet and avoid sticking in the dough. KNEAD properly! If you use any flour which contains gluten (wheat and splet mostly), you'll have to knead until the gluten works properly. 10-15 minutes is definetely not too long. If you make a pure rye bread, you don't have to knead longer than 5 minutes. Rye is exceptionally sticky and annoying to knead, that's why you have set aside another 100gr cold water - wet your hands often while kneading. It'll keep the dough moist and your hands clean. Let the dough rest for half an hour and knead another round. Especially if you use coarsely milled flour or whole wheat bran or oat bran - they need to soak a little or your bread tastes dry. Now put the dough into a bowl onto some baking sheet/baking paper (those non-sticky sheets of paper), cover it with a towel, avoid draft and cold air and let it rise in the oven at something like 35°C-40°C. In my oven (which is old and cheap) it takes 50°C on the scale and about 3-4 hours until the dough has risen to the double amount (filling my bowl completely). Now it's time to heat up the oven to 250°C - as hot as possibly. Heat up your baking stone OR the the gratin form/casserole top with it, it'll help to keep the heat and if you don't use much wheat in your dough and/or have been too lazy to knead the gluten properly (yes, I mean you. ;), you'll need the casserole top to hold the dough in shape. 25 minutes at 250°C, 25 minutes at 225°C and another 35 minutes at 200°C. After the first 25 minutes, before watering the second time also pull back the paper which might have covered parts of the top side of the bread. As you've finished the bread around the evening: It's really good if you let it rest over night and cool it properly - directly from the oven is just too fresh. Variations: As long as you grow and cultivate the sourdough culture with rye, you can bake essentially with every kind of grain you can think of. If you just start out baking bread, start with rye and wheat mixed - wheat helps stabilizing the dough due to the gluten. I also like something like 60% rye - 10% oat bran - 30% wheat mixed (all for the flour part - the sourdough itself is rye anyway..). Seeds like sunflowers, sesame, hemp or pumpkin can be added while kneading or spread on top of the bread. In many regions of Germany, barley is also a common grain to mix into the dough. Some day in the morning mix 100gr rye whole wheat flour with 110gr lukewarm plain water. Cover, set aside somewhere warm, but not too hot. In the evening do the same. Repeat for 3-5 days - every morning and evening. When is smells sour and/or starts bubbling or even rises out of the bowl it's ready to bake - take about 500gr for the bread, set aside the rest and keep it for the next bread. You might have a add a very little amount of fresh yeast to the dough (NOT to the starter mix!) - add about 10gr to help your first dough to rise properly.